Thinking of changing your siding color, but don’t know where to start? If that’s the case, this article has got you covered. Selecting the right siding for your house is going to impact your home’s appearance for years to come. Siding improves curb appeal and increases your home’s aesthetic value. There are many different siding materials on the market, including vinyl, wood, and fiber cement. However, James Hardie Fiber Cement is among the most preferred siding options; it’s made from sustainable materials and lasts longer with little or no maintenance. It’s important that your siding color is on trend and modern, particularly if you hope to sell your home soon. Trends come and go, but there are some home designs that last for several decades. For many years, homeowners have embraced certain tones and colors for such classic home designs. If you match the trim color with the appropriate siding color, then this can improve your home’s aesthetic value. There are so many trim and siding color options on the market, which makes it difficult for homeowners to choose the right one. Here is a list of the most popular siding colors for 2019 that you should to know before you make your decision. Experts Say that these Siding Colors Will Dominate in 2019. Craftsman homes were first designed in the1800’s, when people began to seek out natural materials and handcrafted designs for their homes. While the design diminished in popularity over time, it has reemerged in recent years. According to a recent poll by Trulia group, the craftsman style is the most popular home design among Americans today. Popular siding colors draw their inspiration from nature. Among the most frequently-used siding colors are greens, browns, and beiges. A contrasting trim color is always available to highlight the style’s particular rooflines. Adding a pop of yellow color can transform your home from a unremarkable to a luxurious space suitable for your family. Another famous American style is the farmhouse style, which originated in the rural parts of America. It was initially designed by the colonial families with durability and functionality in mind. It has advanced over the years to attain comforting and flexible characteristics. The unadorned aesthetic and clean lines make it perfect for homeowners who love simple living. Siding has a variety of pre finished color options, but you shouldn’t paint them just any color. For instance, you can combine a white trim and blue siding to give your farmhouse a unique look. Blue siding has been a popular choice for homeowners and there are various shades to select from. It gives your home a unique look that will stand out in the market. 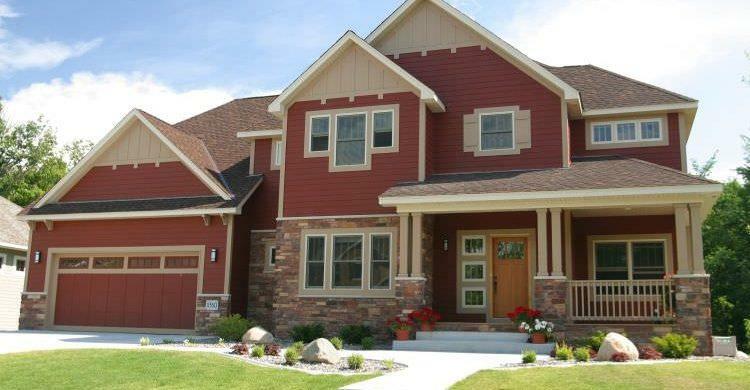 Many homeowners select red siding because of the warmth and the rustic feel it provides. This is a very popular siding color for homes near barn areas and lakes, though this siding is not reserved for rural areas alone. In fact, red siding can be sophisticated and incredibly stylish; it’s slowly creeping into modern developments and cities. You can combine red siding color with bricks to give an elegant appeal. Red doesn’t just bring warmth, but it also brightens your siding to create a natural curb appeal. This color evokes more emotion than any other color in the world. When done properly, red produces nostalgia among the anyone who sees it— with this in mind, homeowners can make a tidy profit upon resale. Blue siding with gray trim is a particularly popular for several familiar home designs, such as Cape Cods or Colonials. Gray siding has become the latest craze in the remodeling market. It is a multi-faceted color that contains various shades. Additionally, gray makes a strong visual statement. You can lighten the appeal with a crisp white trim. Neutral grays are on trend for 2019, primarily because works well with both warm and cool colors. Ultimately, it will be the new beige of 2019. Any siding color will get a brightness boost from white trim, even when it’s paired with white siding. White siding provides vintage and conventional homes alike with a sophisticated feel. Better yet, white is a neutral color that is neither cool nor warm, thus giving your home cozy and instant warmth. This siding color is frequently applied to houses situated along the coastlines. It is an ideal color for creating a subtle, classic home palette. 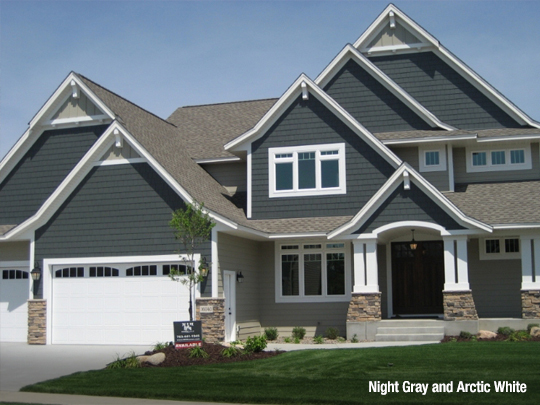 A house siding color simulator will help you select the perfect color for your siding. The simulator will help you to upload a picture of your house and match it with the right siding color. It will virtually assist you to paint your home, which will go a long way toward ensuring that you make the right siding decision. You can select a color palette that suits your style with confidence. Selecting new siding colors can be daunting; in fact, most homeowners fear that they’ll choose the wrong color. Let your home design as well as your personal style guide you as you seek the right color palette for your home. The siding trends discussed above will give help your home look its best and increase its aesthetic value. Of course, there are several factors that come into play when selecting new siding colors for your house. Whether you are remodeling your home to improve its curb appeal or increase its value after resale, selecting the right siding color will help you to achieve your goals. You can explore various siding ideas for farmhouse designs made with James Hardie products.